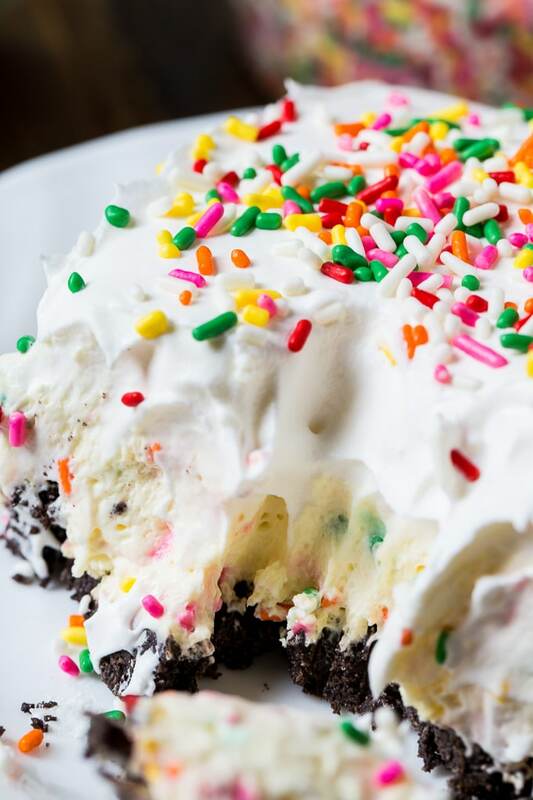 Birthday Cake Lush is a fabulously delicious pudding dessert that’s perfect for anytime you are craving birthday cake. With its super cool and creamy texture, this no-bake dessert is even better than birthday cake. Birthday Cake Lush has an oreo crust made from birthday cake flavored Oreos. 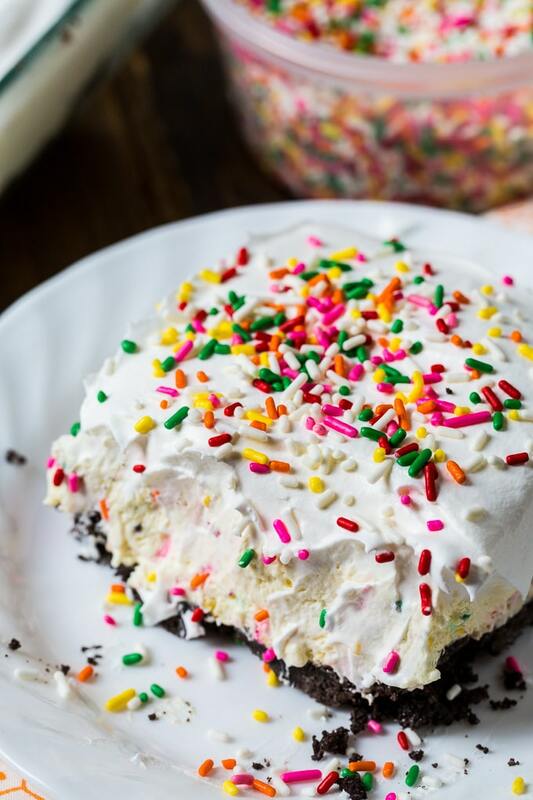 On top of the crust is a pudding layer with funfetti cake mix mixed in to give it cake flavor. The final layer is Cool Whip. You could make homemade whipped cream to use instead of the Cool Whip. 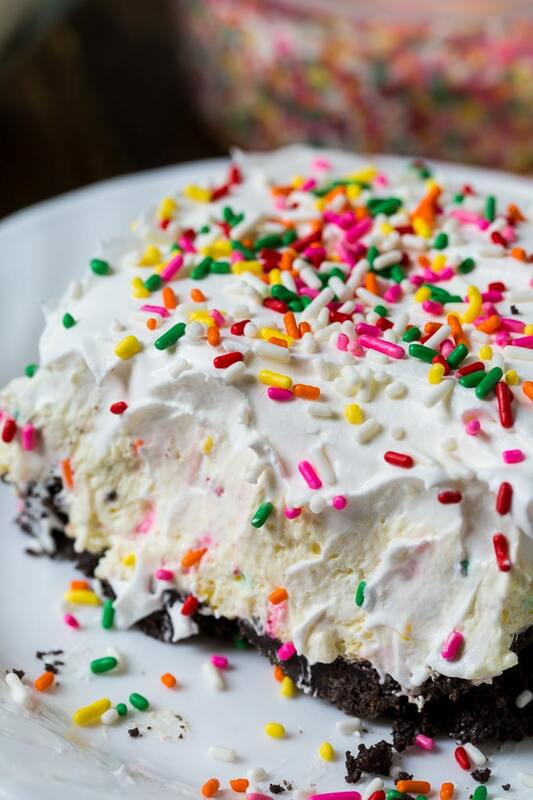 On top- sprinkles. 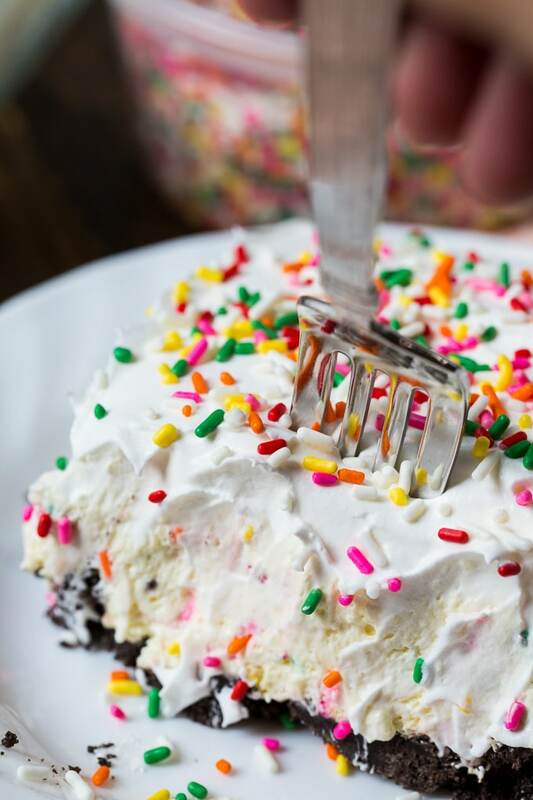 Lots of sprinkles. Don’t they just make you smile? It only takes 15 minutes to assemble this Birthday Cake Lush but it does need some time to chill in the fridge before you serve it. This cool and creamy no-bake dessert is perfect for summer birthday parties and potlucks. 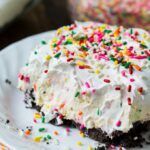 Birthday Cake Lush is a fabulously delicious pudding dessert that's perfect for anytime you are craving birthday cake. With its super cool and creamy texture, this no-bake dessert is even better than birthday cake. Process cookies in a food processor until ground. Combine cookie crumbs and melted butter in a bowl, and stir well. Pour mixture into a 11x7-inch pan or a 9-inch square pan. Press them evenly into the pan with your fingers. Set aside. In a large bowl, combine vanilla pudding mix and cake mix. Whisk in milk for 1 minute, or until it thickens. Fold in half of the Cool whip and 1/3 cup sprinkles. Pour over crust. Cover with plastic wrap and refrigerate for at least 4 to 6 hours or overnight. Just before serving, spread remaining Cool Whip on top and sprinkle with sprinkles. If you’re a fan of lush desserts, you must try this Butterfinger Lush. It is incredible! Watch the video below to see how to make it. This entry was posted in Desserts and tagged cake batter. Bookmark the permalink. Would you like to tell me how can we make such things while sitting at home, most of the videos skip some important steps, I was planning to make a Pizza but dow was not made perfect by myself? 1.) do I combine the cake mix and vanilla pudding mix as is and just add the one cup of milk, or am I supposed to follow the box directions to make the cake and pudding mixes before adding it to the bowl? 2.) After combining the pudding and cake mix, do I mix in the cool whip then add it on top of the oreo layer, or do I spread the mix layer on first then add the cool whip on top of that (so it’s two separate layers)? Do not follow the box directions. Just mix the dry cake and pudding mixes with the milk. Then mix half of the Cool Whip into the pudding mixture. Save the other half to spread on top as a separate layer.